United Overseas Bank ("UOB") was incorporated on 6 August 1935 as the United Chinese Bank. Founded by Datuk Wee Kheng Chiang, the Bank catered mainly to the Fujian community in its early years. The change of name was effected in 1965. Over the past 76 years, UOB has grown from strength to strength. Through a series of acquisitions, it is now a leading bank in Asia. Besides Far Eastern Bank in Singapore, UOB’s major banking subsidiaries in the region are United Overseas Bank (Malaysia), United Overseas Bank (Thai), PT Bank UOB Buana and United Overseas Bank (China). Today, the UOB Group has a network of over 500 offices in 19 countries and territories in Asia Pacific, Western Europe and North America. 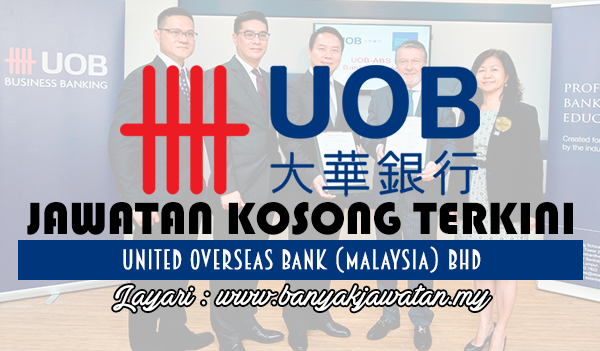 0 Response to "Jawatan Kosong di United Overseas Bank (Malaysia) Bhd - 16 Ogos 2018"